Back in September I wrote about how we were in the midst of bed transitions. We had ordered the boys bunk beds and were waiting for them. In the interim we were all sleeping on the floor. Jim’s and my stint on the floor only lasted a few weeks. We are loving the new king bed and getting used to the rearrangement of our furniture. The boys bunk beds arrived two weeks ago and they are loving it. 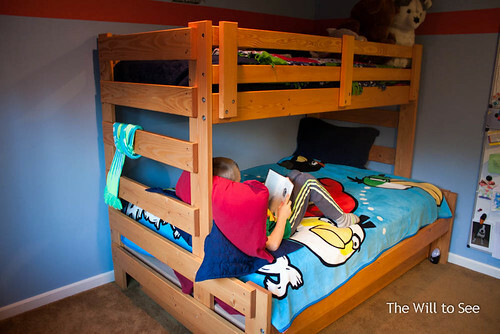 They were built by Ben from Vertical Bunk Beds on Bainbridge Island. He even delivered and set them up. We are so please with the quality and design. 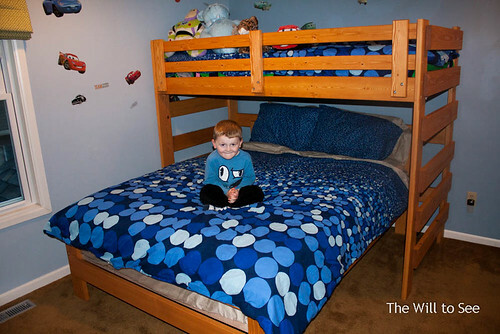 Jack now has three beds in his room, a twin over full plus a trundle. Will gets the extra long twin over a queen. They have traded off sleeping in the bottom and top bunks. I have told them that I only change one set of sheets a week, so choose wisely. We have doubled the number of real beds in our house from three to six and are ready to host my sister’s family at Christmas time. Everyone will have a bed! If anyone is up for a sleep over let us know, we can now host.